3463 Private William Aysh of the 2nd/6th Battalion, the Devonshire Regiment. Son of Bastable and Maria Aysh. Born in South Tawton in 1896. Died in India 18 December 1916 aged 20. 13746 Private Thomas Brook of the Coldstream Guards. Son of George and Eliza Brook of Spreyton. Born in Spreyton in the March Quarter of 1883. Died 12 March 1916 aged 34. Captain Charles William Bruce of the 61st Squadron, the Royal Flying Corps attached to the Gordon Highlanders (the Black Watch). Son of Mr A. D. A. Bruce of Acton Burnall Park. Born in 1895. Died in a flying accident 22 November 1917 aged 22. 34669 Private Cecil John Copplestone Davey of the 5th Battalion, Princess Charlkotte's Regiment (The Royal Berkshires). Son of John Davey and the late Mary Jane Davey. Born in Spreyton in 1899. Died 30 November 1917 aged 19. RME/5709/S Lance Corporal Robert A. Hansford of the Royal Marine Engineers. Son of John and Emily Hansford. Born in Dulverton, Somerset, in 1876. Calculated death date some time in 1916. He was aged 40 when he died according to the memorial..
13953 Private William Harvey of the 4th Battalion, the Coldstream Guards. Son of John and Sarah Harvey of Spreyton. Born in Spreyton in the December Quarter of 1895. Died 24 April 1916 aged 21. 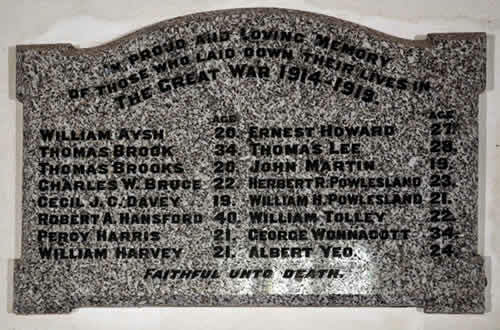 DM2/179326 Private Ernest Howard of the Royal Army Supply Corps. Son of William and Maria Howard. Born in Copplestone in 1891. Died 30 October 1918 aged 27. S1/4167 Corporal Thomas Peters Lee of the 24th Supply Coy, the Army Supply Corps. Son of Emmeline Lee of the New Inn, Copplestone and the late William Lee. Born in Copplestone in the September Quarter of 1890. Died 1 November 1917 aged 28. 20032 Private (William) John Martin of the 9th Battalion, the Devonshire Regiment. Son of John and Emma Martin of South Tawton. Born in South Tawton in the June Quarter of 1896. Died 24 April 1916 aged 19. K/4238 Leading Seaman Herbert Richard Powlesland of the Royal Navy, HMS Indefatigable. Son of Henry and Mary Powlesland. Born in South Tawton in 1893. Died at the Battle of Jutland 31 May 1916 aged 23. 4823 Gunner William John Powlesland of No 3 Depot, the Royal Garrison Artillery. Born in South Tawton 1 September 1891. Died 23 September 1915 aged 21. Buried in Plymouth Efford Cemetery. M/10304 Cook's Mate 2nd Class William Tolley of the Royal Navy, HMS Vivid (Shore Base). Born in North Tawton 15 March 1894. Died 20 September 1915 aged 22. 14287 Private George Wonnacott of the 2nd Battalion, the Dorsetshire Regiment; formerly 9603 of the Devonshire Regiment. Son of Thomas and Grace Wonnacott. Born in Bow in 1882. Died 22 April 1916 aged 34. 51192 Private Albert Yeo, known as Henry of the 2nd Battalion, the Welsh Regiment. Son of George and Alice Dimond of Spreyton. Born in Spreyton in the December Quarter of 1893. Died 14 February 1917 aged 24.